Interested in a Payment Plan? For qualifying orders of over $100 you can pay in 3 installments over 60 days. Add to bag Item added to cart successfully. The SPIO® Wrist Hand Orthosis** assists with fine motor control, increased stability, decreased hypersensitivity, and sensory awareness in the hand and wrist. It is ideal for children with Hemiplegia, Athetoid or Spastic Quadriplegia, Rett Syndrome, Angelman Syndrome, Autism, and Sensory Processing Disorder. 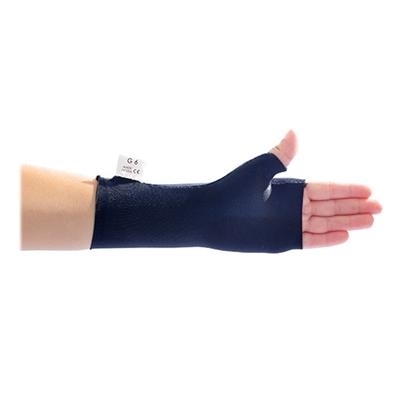 **SPIO® Wrist Hand Orthosis is sold singly, not in pairs. If your patient falls outside the standard range of sizes, we can meet your needs with a custom-designed SPIO® Orthosis. Click here for details. Measure each child according to the Sizing Guidelines for a good fit, never select a size for your patient based on "eye-balling" the SPIO®. 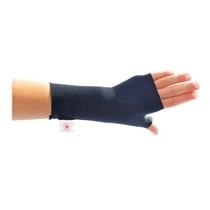 Don Wrist Hand Orthosis as you would a pair of gloves. The Wrist Hand Orthosis can fit on either of the patient's hands.